With the nation’s attention rightly transfixed by the Senate GOP’s monstrous efforts to ram through a Supreme Court nominee who has been credibly accused by multiple women of sexual assault, House Republicans on Friday voted overwhelmingly to approve another $3 trillion in tax cuts for the wealthiest Americans just weeks before the November midterms. 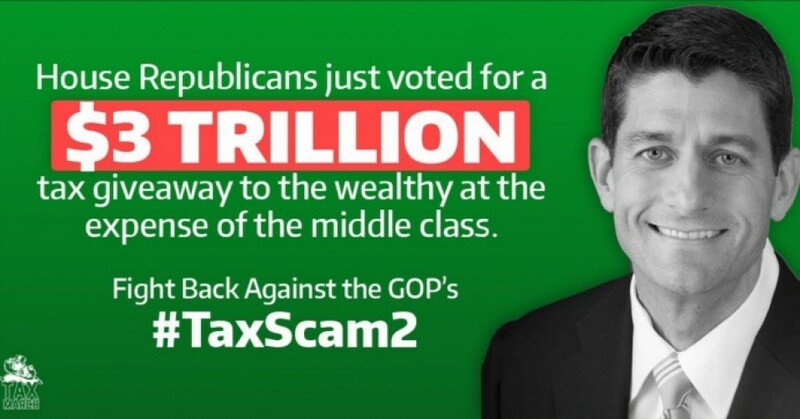 SHAME on these GOP U.S. Reps who just voted for #TaxScam2 — more tax cuts that mostly benefit the rich over working families. According to the an analysis by the nonpartisan Tax Policy Center (TPC), the House GOP’s measure—which progressive critics have denounced as “Tax Scam 2.0″—would send the vast majority of benefits to the very top. “The richest one percent of filers would see an average tax cut of $40,000, while those in the middle 20 percent of earners would see an average cut of $980,” the Washington Post noted in a summary of TPC’s findings. As Kavanaugh proceeds, House GOP just passed by 220-191 margin a second round of tax cuts estimated to cost $3.1 trillion in 10 years on top of $1.9 trillion cost of original tax law. This entry was posted in #MeToo, Austerity, Civil Rights, Corruption, Economics, Government, Health Care, Income Inequality, Supreme Court, Women's Issues, Workers' Issues and tagged #GOPTaxScam, #TaxScam2, Brett Kavanaugh, Capitalism, Conor Lamb, Corruption, Economics, Health Care, Human rights, Income Inequality, Jacky Rosen, Kyrsten Sinema, Medicaid, Medicare, Patriotic Millionaires, Richard Neal, social security, Supreme Court, Tax Policy Center, Women's Issues, workers' issues on September 29, 2018 by ew.